Adapted from Savant's earlier DVD review. Robert Wise, flush from the commercial triumph of The Sound of Music, made this strongly felt Road Show film to contemplate the issue of America as a colonial power mired in the Far East. Choosing an older historical situation, the middle 1920s when unwelcome foreign flags still patrolled the rivers of China, Wise takes the familar route of presenting 'the inscrutable East' as an undecipherable riddle. The Sand Pebbles builds toward making a fresh statement, only to fall back on the same old message: Americans just aren't themselves unless they're in the middle of a fight. Patrolling a Chinese backwater where civil war is taking its toll on foreigners and missionaries, the gunboat San Pablo has no clear mission and has fallen into a state of lethargic indolence, with local 'coolies' doing all the work for its peacetime warriors. New ship's engineer Jake Holman (Steve McQueen) trains illiterate Chinese Po-han (Mako) as his new engine assistant and begins a chaste flirtation with idealistic missionary Shirley Eckert (Candice Bergen). His buddy Frenchy Burgoyne (Richard Attenborough) falls hopelessly in love with Maily (Marayat Andriane), a Chinese girl marked for a life of prostitution. Local agitators use their doomed affair to spark a political incident, and the San Pablo is besieged in a locked-horns diplomatic standoff. Humiliated gunboat commander Collins (Richard Crenna) becomes so disturbed by the ordeal, he seizes on the opportunity to fling the San Pablo into a reckless military action. Jake, a loner despised by his crewmates, finds himself fighting a war he doesn't believe in. It was certainly a bold move for Robert Wise to take on a story about colonial conflict right during the troubling and unpopular war in Vietnam. The subject doesn't lend itself to simplification, as is proved by Wise's earlier I Want to Live!, a compassionate but (now) possibly incorrect reading of a capital punishment case. No matter what steps Wise and his writer take to present the Chinese in a fair light, the result is still paternalistic and patronizing. The script discusses Communists and Nationalists but American audiences in 1966 naturally identified the film's 'treacherous' Chinese belligerents with the News Hour boogeymen Ho Chi Minh and Mao. Wise is eventually unable to make a coherent statement: the only lesson we learn is that having anything to do with Asia is a bad idea. Everything is shown from the American point of view. The sailors endure humiliations (Navy uniforms pelted with filth, savage cruelty) that action-loving Americans readily accept as action triggers, an excuse to let loose the big guns and sort out the bodies later. The tender love story between McQueen and a radiantly fresh-faced Candice Bergen, with its attendant hopes for a peaceful resolution, comes to less than nothing. All of the talk about running away to some happy place, with the Internationalist missionary pronouncing himself a stateless person, is futile. This is a war film, by damn, where two hours of frustration had better climax with a rip-roaring, sabers-out battle. In the long run, it's the Marines versus the Chinamen and nothing else matters. The major culprit is the Road Show format. Some reserved-seat Road Show attractions had been so successful that all kinds of subjects were being stretched to three hours with an intermission. Not every film concept is Lawrence of Arabia or has a dozen dynamite musical numbers, so audiences suffered through long, limp films like Custer of the West and The Hallelujah Trail. 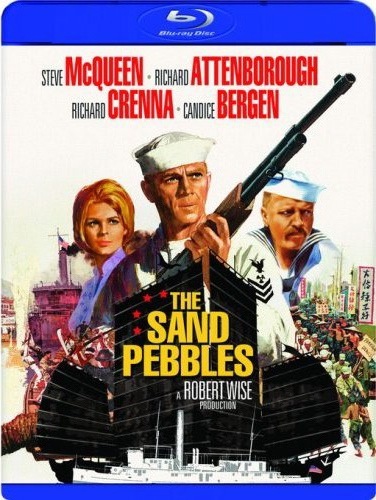 Wise's The Sand Pebbles, goes for a slow pace and too many unrewarding plot sidetracks. It would play much better at a little over two hours or so, with fewer 'meaningful' slow scenes. Both Po-Han's struggle and Richard Attenborough's pathetic romance are set up for easy tragedy. The Chinese use the San Pablo for false propaganda, harass Frenchy and his secret Chinese bride and torture Po-han. Even after the picture reverts to a gung-ho battle to pick things up, it remains a depressing downer. The imitation For Whom the Bell Tolls ending, with a heroic Steve McQueen alone in the dark, is an empty epitaph for a film that doesn't even begin to deal with its own subject matter. The Americans fail because the San Pablo is a disgrace corrupted by easy colonial living: the sailors pay Chinese coolies to do everything on board, from cleanup to laundry to shaving. They have no pride in their own boat. The irresponsible Captain Collins foolishly overreacts to every provocation and parades his weapons as if he expected the jeering mobs to take him seriously. His boat is an easy propaganda target for the clever revolutionaries. At the time, Steve McQueen's Jake Holman personified the honest young Vietnam draftee. His sincere effort to communicate with Po-han is the picture's only successful linking with the "inscrutable" Asian race. Candice Bergen does a superlative job as the sweet missionary character. Richard Crenna plays the mentally constipated captain as a soldier incapable of dealing with politics. The captain got an undeserved laugh when he draws his cutlass. The authentic detail seemed a silly anachronism in 1966 -- today the brandished sword would probably evoke cheers. Lovesick sailor Richard Attenborough does his best but his role seems a calculated Oscar bid, a la Red Buttons in Sayonara. Attenborough's extended subplot unfortunately does the most to bog down the proceedings. The rest of the cast also seem to know that they're in Something Significant, and try a little too hard, with Ford Rainey and Simon Oakland chewing the scenery. Mako has the screen time to develop his character Po-han, and comes off memorably. Fox Home Video released a 2-disc special edition DVD of The Sand Pebbles just last year, finally unveiling the Road Show cut of the 1966 film as an added extra. Unlike the nicely-transferred theatrical version, the Road Show was sourced from a surviving print and severely faded to magenta. This Blu-ray disc presents all of the extras from that 2-disc DVD save for the full Road Show cut, which is instead represented by an extra gallery of scene additions. For someone not excited about sitting through three hours of faded film, this may be the better way to see the added material. For a run-down of the Road Show differences, read the second half of Savant's older The Sand Pebbles review. The Blu-ray transfer is very handsome, with a few qualifiers. Most of the film is as sharp as a tack, but many close-ups and even random shots don't seem as sharp as they should, as if the camera were a bit out of focus. A razor-sharp view of the boat in the Yangtze will cut to an interior of Richard Crenna that doesn't look all that much better than regular DVD. I didn't notice this effect all of the time, I hasten to add. And with only one Blu-ray player in which to check the disc, I'd hate to steer people away from what might not be a problem. Unlike many Road Show pictures, The Sand Pebbles was filmed in ordinary 35mm Panavision, albeit carefully enlarged to 70mm. Robert Wise and his designers Boris Leven and Maurice Zuberano like clean lines and sharp images, and the show has many beautiful scenes. Fox clearly knows that this Steve McQueen superproduction will immediately attract the owners of new Blu-ray equipment. McQueen's blue eyes are indeed something to see at this level of detail. Present from the earlier releases are a commentary with Robert Wise, Candice Bergen, Mako and Richard Crenna, and an isolated track of Jerry Goldsmith's music score. When no music plays, the gaps are filled with commentary from Nick Redman, Jon Burlingame and screenwriter Lem Dobbs. The rest of the extras also duplicate the contents of the earlier special edition. Disc producer Michael Kurcfeld assembles at least ninety minutes of featurette material on the making of the movie, with added 'sidebar' shows on Steve McQueen and Robert Wise, and even a piece on Chinese history of the time. The late Robert Wise appears in file interviews and is joined by Richard Attenborough, Candice Bergen, Neile McQueen, Robert Relyea and many others. Fox-generated extras include two original featurettes, a pair of radio documentaries, radio spots, a trailer and stills. Supplements: Commentary with Robert Wise, Candice Bergen, Richard Crenna, Mako; Isolated music score commentary with Nick Redman, Jon Burlingame, Lem Dobbs; Trivia track, Road Show Version Scenes isolated, Featurettes: The Making of the Sand Pebbles, Steve McQueen Remembered, Robert Wise Remembered, China 1926 Remembered, A Ship Called San Pablo, The Secret of San Pablo; radio documentaries, Radio spots, Trailer.